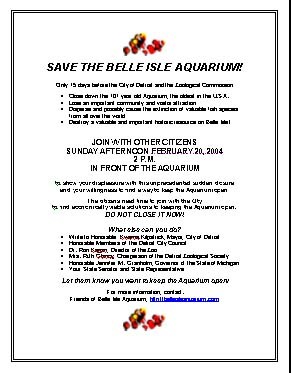 SAVE THE BELLE ISLE AQUARIUM! � Close down the 101 year old Aquarium, the oldest in the U.S.A.
� Destroy a valuable and important historic resource on Belle Isle! and your willingness to find a way to keep the Aquarium open! to find economically viable solutions to keeping the Aquarium open. DO NOT CLOSE IT NOW! Let them know you want to keep the Aquarium open!